The State and the Central governments have decided to impart self-defence courses for girls in all government-run schools in the State. About 3.88 lakh students would be provided training during 2017-18, in 5,605 schools in the State. Commissioner of School Education Department and Rashtriya Madhyamik Shiksha Abhiyan (RMSA) have issued instructions to all headmasters and Project Coordinators in the State in this regard. The pilot project would be implemented in all Mandal Praja Parishad Upper Primary, Zilla Parishad High Schools, Kasturba Gandhi Balika Vidyalayas, municipal, social and tribal welfare and model schools in all the districts. Martial arts will be a subject in the curriculum which helps to improve their self-defence mechanism, the officials said. The theme of introducing self-defence skills and martial arts is to enlighten the girls on self-protection techniques and also to attain physical fitness among adolescent girls. The District Educational Officers (DEOs) have been asked to take measures for successful implementation of the project and the headmasters should allocate two hours per week for the trainers in each school. 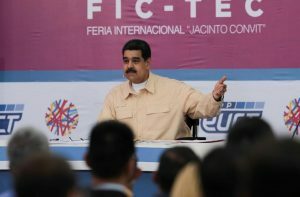 Venezuela’s President Nicolas Maduro has announced the launch of a sovereign cryptocurrency “petro” which could bypass the U.S.-led financial sanctions, according to a market commentator. It is no surprise that digital currencies have become more popular as reports have been emerging that Venezuela’s economic crisis is triggering increased use of Bitcoin due to its currency — the bolivar — plunging in value. Caracas is the capital of Venezuela. Bolivar is the currency of Venezuela. World Soil Dayis observed on 5th December across the world. The 2017 Themefor World Soil Day is ‘Caring for the Planet starts from the Ground’. The main aim to communicate messages on the importance of soil quality for food security, healthy ecosystems and human well-being. It is celebrated annually on the 5th of December at the Food and Agriculture Organization of the United Nations (FAO) headquarters in Rome, the regional offices and through national and local events. Technology giant Google launched a lightweight Android Oreo Go edition operating system designed for devices with RAM up to 1 GB. According to Google, the Android Go offers 30% faster startup time and up to 2 times optimisation of storage space. There’s also a Go version of the Play store with lightweight apps including YouTube Go and Gmail Go. British singer-songwriter Ellie Gouldingsigned as a Global Goodwill Ambassador for UN Environment, joining the fight to save the lives and habitats of people and animals by cleaning up our air and seas, fighting climate change and protecting species. Paytm Payments Bank rolled out Paytm FASTagto enable electronic toll fee collection on highways across the country, in line with the government’s move to make FASTag mandatory on every new vehicle sold from December 1. The Paytm FASTag – which is a simple and reusable tag based on radio-frequency identification technology (RFID) that can be placed on a vehicle’s windscreen – will allow commuters to pass through 380 toll plazas across India covering 55,000 km without having to stop. Punjab’s Shubman Gill has been named as Shaw’s deputy. The Indian governmentallowed over 1,300 Buddhist refugees from Myanmar’s Rakhine region to enter Mizoram. The refugees fled Rakhine due to the ongoing war between the Myanmar’s Army and the Arakan Army, comprising Buddhist insurgents instructed to Additional police, health workers and doctors have also been deployed for the refugees. Bollywood superstar Amitabh Bachchanlaunched a book based on Indian cinema in showbiz capital Mumbai. The book, titled ‘Bollywood: The Films! The Songs! The Stars!’, is a coffee table book, which provides historical insights, lesser-known facts and behind-the-scenes exclusives of the most iconic movies made in the history of the Indian film industry.